Today though, I wanted to start my series of New York Fashion Week posts with a recap of outfits I wore. Street style is such an important part of fashion week; and it is so interesting and inspiring to see the different outfits people come up with and the different messages they are trying to send with said outfits. Since NYFW is an opportunity to style outfits that you may not get to wear in every day life and to really have fun with styles and fabrics and the history of fashion, I wanted to create outfits that, to me, represented power. As many of you know I can get a *tad* passionate when it comes to the idea of propelling women forward in their careers, and the idea of helping women become complete Girl Bosses. So, with this idea of empowering women in the back of my mind I decided for NYFW to create outfits inspired by traditional roles of power but with my own modern feminine take. I couldn’t find my pants in this color pattern, but I have linked them up in a different color below. The ‘track pant’ look is back in style (crazy, I know) so stay tuned later in the fall as I’ll be styling these bad boys in a work appropriate outfit. I’ll also be wearing this military inspired white blazer to work a ton this year. My white shoes, you can’t really see it, but they have an incredibly deep V shape to the toe. This is one of the biggest trends in footwear this season, and I cannot recommend these shoes enough!! The next outfit I wore was a 1920’s banker inspired look. I love that era of men’s fashion – with pinstripes and suspenders and a general sense of power. When I saw these jogger pants with suspender detailing I knew I had to create a modern feminine ‘banker’ look. This pinstripe top with a belt felt like the perfect pairing to the pants – and I love the modern edge of having one shoulder showing. Beware if you buy this shirt (which you should, because it’s honestly awesome) it has no buttons – ie. the fabric gets wrapped and then held in place by a belt. Just a heads up! I went with my gorgeous large Celine bag (thanks to Le Tote for loaning it to me!) as it reminded me of the large structured briefcases a banker would have had. My next look was inspired by women of the 70’s – women who started stepping out of traditional roles and started fighting for our right to be whomever and whatever we want to be. I went with flats with this look because while platforms were in in the 70s, it was also the era of women taking control of their style and comfort and flats made a huge comeback. I paired this look with my Celine bag… to be honest not for an style inspiration reason, but because once I had this bag in my hands, I couldn’t put it down! haha. I practically slept with this in my bed at night I love it so much! I couldn’t find my exact flats, so I linked up two similar pairs below. I also linked up (of course) my floral dress and Celine bag! That’s it for now! I will be doing another post tomorrow (a rare Saturday post!) with Part 2 of my NYFW outfits, so be sure to come back tomorrow to check it out. 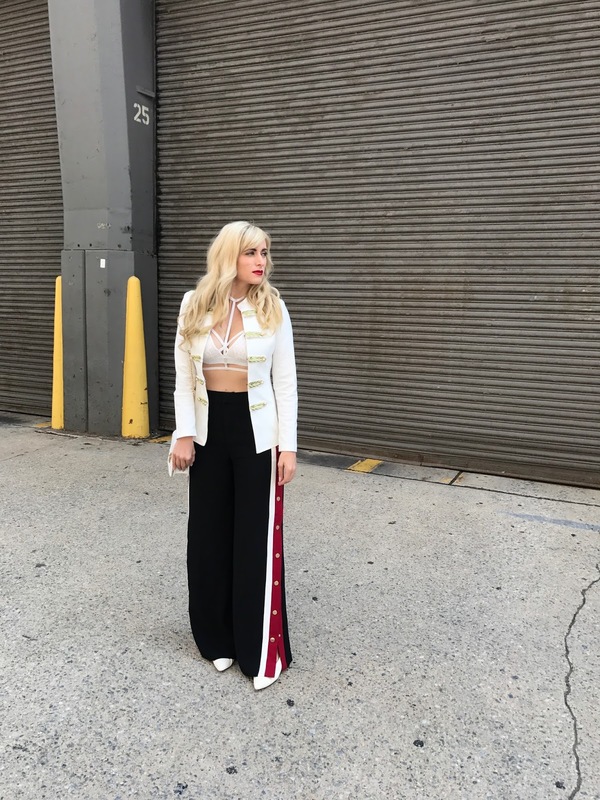 "New York Fashion Week – Outfit Recap (Part 2)"
SLAY!! Seriously you look amazing! Fabulous looks for NYFW!! Haha you are the sweetest Elise, thank you!! All of these looks are amazing! I'm obsessed with that military jacket! You are so sweet Lizzie, thank you! Wow look at you! So glad you had such an amazing time! In your Outfit number 1, the PrettyLittleThing Kamilla White Harness Lace Bralette and white Braeley Blazer look very pretty styled together, and the contrasting black H+M trousers coordinates beautifully with your OOTD. Your banker inspired outfit 2 looks great too. I Love florals, and the floral print dress you styled in Outfit 3 is beautiful! You look fabulous in all three outfits!